Canisius erased an 11-point deficit in the final 40 seconds of regulation and went on to beat Louisiana-Monroe in triple overtime Tuesday night, 108-96, tying the NCAA record for largest deficit overcome in the final minute of a game. Canisius joined UNLV as the only Division I basketball team on record to ever win a game when trailing by 11 points with less than one minute to go. No team had ever trailed by as many points as Canisius with less time remaining while still managing to win the game. The victory pairs Canisius with Nicholls State for the final round of the Continental Tire Las Vegas Classic on Wednesday. Tipoff at Orleans Arena is set for 5 p.m. Eastern. Poor free-throw shooting doomed UL-Monroe, which missed six of its last seven free throws in the final 1:10 of regulation. Canisius made all four 3-pointers it took in the final minute. 11 – Canisius trailed by 13 points before freshman Chris Atkinson started the comeback, hitting two free throws with 1:02 to play. 8 – Justin Roberson missed the front end of a 1-and-1 on UL-Monroe’s next possession before Atkinson hit a 3-pointer with 40 seconds left to cut the deficit to eight points at 77-69. 5 – Nick Coppola was the next Warhawk to miss the front end of a 1-and-1, and Isaiah Gurley hit a 3-pointer to make it 77-62 with 32 seconds left. 3 – After UL-Monroe entered the double bonus, Majok Deng hit 1-of-2 free throws with 25 seconds left, but Canisius’ Jermaine Crumpton hit a 3-pointer just three seconds later to make it a one-possession game at 78-75. 0 – Travis Munnings missed both of his free throws with 19 seconds left, which set up Atkinson’s game-tying triple with 12 seconds remaining. Canisius erased an 11-point hole in just 28 seconds of game time. ULM coach Keith Richard took a timeout with four seconds left to draw up a play for a game-winning shot, but Deng’s late 3-pointer missed. ULM’s Marcus Washington fouled Malcolm McMillan on a 3-point attempt with six seconds left while Canisius trailed by two. McMillan hit all three shots to put the Griffs up by one. ESPN then sent out an alert that the game had gone final, but jumped the gun – ULM had two free throws to shoot in the final second. Coppola made the first but missed the second, sending the game to a second overtime. Deng tied the game with 37 seconds left, but Canisius looked like it would win when Kassius Robertson was fouled with one second remaining. Nope. He missed both shots to force triple overtime. Canisius outscored ULM 12-0 in the final overtime period to clinch a share of an NCAA record. McMillan had eight of the 12 points while Robertson found a bit of redemption, hitting both of his free throws. Four ULM players fouled out in the game, including three starters. Only Atkinson fouled out for Canisius. Robertson finished with a career-high 28 points, which led all players. McMillan had 21 for the Griffs, while Phil Valenti had 16 and Atkinson and Crumpton each scored 13. ULM had six players in double-figures, led by Deng’s 21. The win also gave Baron an opportunity to use his favorite phrase. The win brought the Griffs to 5-6 and marked their first win this season away from the Koessler Athletic Center. ULM also moved to 5-6. Coppola played a school-record 54 minutes for ULM. Robertson led Canisius with 48 minuted but didn’t come close to the school record Billy Baron set by playing all 55 minutes of a triple-overtime win against Siena in 2014. Canisius improved to 5-1 all-time in games going three overtimes or longer. That includes Canisius’ 4OT win over N.C. State in the 1956 NCAA Tournament, which Sports Illustrated in 2014 ranked as the No. 1 tournament upset of all-time. What it means: Exam week must’ve been rough at Boston University. The Terriers were flatter than week-old pop in the first half – committing 16 turnovers – and woke up only briefly after halftime before losing by 16. Canisius snapped its three-game losing streak, which was only one off Jim Baron’s longest such streak at Canisius, and looked to get its defense back in order with two nonconference games remaining. Canisius improved to 4-6 while BU fell to 5-6. How it happened: Canisius made BU pay for its miserable first half. Phil Valenti pushed the Griffs’ lead to double-digits midway through the first half with eight points in a span on 1 minute and 14 seconds while the Terriers averaged a turnover per minute for much of the opening 20 minutes. Canisius led by 19 at the break, which was its largest halftime lead in the last two seasons. BU cut Canisius’ lead to eight points a few times in the final 10 minutes but never looked truly dangerous. BU finished with 24 turnovers. Valenti led all players with 21 points while Malcolm McMillan had 20 and Kassius Robertson had 13. BU was led by Eric Fanning’s 18 points andJohn Papale’s 16. Canisius never trailed. Glass men: Canisius’ offensive rebounding was on display Saturday as the Griffs finished with 21 offensive boards – one more rebounds than they corralled on the defensive end. Jamal Reynolds led the way with four offensive boards (and 12 total) while McMillan and Kevin Bleeker had three each. Play of the day: Jermaine Crumpton fooled a defender with a slick fake pass and then calmly hit a wide-open three-pointer with 13 minutes left in the game. It was a nifty move from the big man, who has scored double-digit points in six of his seven games since returning from suspension. Honorable mention: Kevin Bleeker swatted Kyle Foreman’s shot into the third row with 9 minutes to play. T’d up, ejected: Crumpton and BU’s Nick Havener were given matching technical fouls with 6:24 to play. BU converted both free throws while McMillan hit 1 of 2 for Canisius. The replays didn’t show any egregious physical contact. BU coach Joe Jones was ejected with 1:55 to play. BU coach Joe Jones T'd up and ejected with 1:55 to play. He was upset over a foul call and yelled at the refs too much for their liking. Valenti down, but OK: Valenti was down in pain after drawing a charge late in the first half. He appeared to be holding his chest or rib area. He was able to walk off the court. … He sat the last 1:46 of the first half but started the second half. First time’s the charm: Jim Baron’s first game with Canisius was a home game against Boston University. The Griffs won, 83-75, behind 22 points from Harold Washington and 21 from Billy Baron. Pedal to the floor? : Jones, the BU coach, was excited to be in Western New York, near his alma mater of SUNY Oswego. Jones, however, may have a significant case of lead foot. Cruise control is your friend, Joe. Starters: Canisius – McMillan, Robertson, Reynolds, Valenti, Bleeker. BU – Papale, Mosley, Dieudonne, Foreman, Haines. Refs: Brandon Cruz, Justin Simon, John Floyd. Next: Tuesday vs. Louisiana-Monroe in Continental Tire Las Vegas Classic, 5:30 p.m. ET. The Griffs have yet to win a game this year outside of the Koessler Athletic Center. Gameday: Canisius home opener vs. Lehigh, 7 p.m.
Canisius looks to bounce back from a season-opening loss to Hofstra when Lehigh visits the Koessler Athletic Center tonight at 7 p.m.
Canisius Golden Griffins: 0-1 overall, 0-0 home. Streak: L1. KenPom rank: 160. Lehigh Mountain Hawks: 0-1 overall, 0-1 road. Streak: L1. KenPom rank: 122. What’s at stake: Both teams are looking for their first win of the season after losing Friday night. It’s the home opener for Canisius, while Lehigh continues a tough opening stretch that features six of its first seven games on the road. Canisius has never been more than one game below .500 under fourth-year coach Jim Baron (and it was never more than two games above .500 under Tom Parrotta). 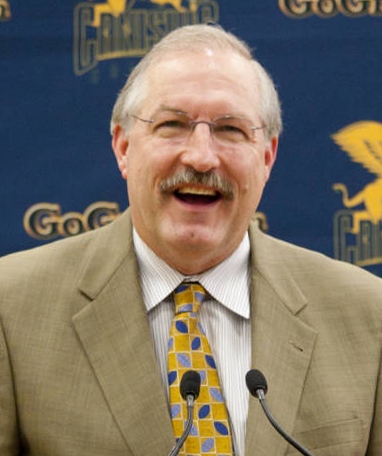 Canisius has never been two games below .500 under Jim Baron. Top dogs: For the second game in a row, Canisius faces both a team that was picked first in its preseason poll and the player who was named the league’s preseason Player of the Year. Tonight Canisius will have to deal with Lehigh center Tim Kempton, who averaged 15.3 points and 8.7 rebounds per game last year before being named Patriot League Player of the Year. Hawks hang with Orange: Lehigh actually made a run on Syracuse in Friday’s opener, cutting the Orange’s lead to just six points midway through the second half. The Orange went on to win 57-47, but not before Kempton posted a double-double with 16 points and 12 rebounds. Encore performance: How does Malcolm McMillan follow up his stellar first game? The Central Connecticut transfer dropped a career-high 33 points and recorded six assists Friday in his first game. According to Canisius SID Matt Reitnour, that was the most points for a player in his Griff debut since Larry Fogle opened with 35 points in 1973. Fogle went on to lead the nation in scoring that year at 33.4 points per game. McMillan obviously can’t be expected to continue scoring at that pace, but if he can consistently produce even half of what he put up Friday, he’s going to make the Griffs a very dangerous team in the MAAC. Short up front: Canisius will again be without forward Jermaine Crumpton, who serves the second game of his three-game suspension Monday. The status of forward Cassidy Ryan, who didn’t travel to the last game due to a death in his immediate family, is unknown. Six-foot-8 sophomore transfer Ron Gombe played two minutes in the opener but didn’t record a stat. Return game: Canisius played Lehigh in its second game of last season as well, winning 63-51 on the road. Zach Lewis had 24 points and Jamal Reynolds had 12. Kempton led Lehigh with 19. It was Baron’s first career game against the Mountain Hawks. Good home-opening numbers: Canisius is 53-21 all-time in home openers and 14-9 in home openers at the KAC. Canisius hasn’t lost a home opener under Baron. Random player tweet: Goals, Timothy. Goals. As an interesting aside, Kemtpon is actually Tim Kempton Jr., and his dad, Tim Sr., played college basketball at Notre Dame in the 1980s while Jim Baron was an assistant there. How to follow the game: You could go to the game, or watch online via WatchESPN. Jay Moran’s radio call goes out on 102.9 FM and 1230 AM. I’ll tweet updates @NickVeronica, and I probably should update the Twitter list of Big 4 basketball writers. I’ll have a recap posted shortly after the final buzzer. How it happened: Malcolm McMillan’s first performance as a Griff was even better than Billy Baron’s, but Canisius couldn’t hold a huge first-half lead as Colonial Athletic Association favorite Hofstra came back to win 96-85 in the season opener for both teams. Canisius flew out of the gates, opening up an 18-point lead on Isaiah Gurley’s 3-pointer with 8:08 left in the first half. But Hofstra cut the deficit to just two points at halftime as Canisius struggled against Hofstra’s 1-3-1 zone defense. Canisius pushed the lead back to 11 with just nine minutes to go, but Hofstra outscored Canisius 18-5 over the next six minutes. Save for an uncontested, last-second layup, Canisius was held scoreless over the final 2:39, missing all four shots it took. McMillan led all players with a career-high 33 points, but that wasn’t enough to top the Pride, which had six players in double-digits. (I don’t know if I’ve ever seen that in a Canisius opponent before. Didn’t happen in any of Billy Baron’s games against Iona, or even in VMI’s 111-100 thrashing in the 2013 CIT.) Jamal Reynold and Kassius Robertson had 13 points each. What it means: The Griffs will be frustrated with how they lost, but hanging with a team as well-respected as Hofstra is an encouraging sign for Canisius, which was missing two forwards Friday (more on that below). We also learned that Malcolm McMillan has some serious game. The fifth-year transfer from Central Connecticut scored a career-high 33 points in his first Canisius game and showed a veteran savvy throughout the contest. The lefty was 13 of 20 from the field and 4 of 9 from deep while handing out six assists and recording two blocks, including one huge block on a shot that would’ve cut Canisius’ lead to one just before halftime. He was credited with three turnovers. McMillan left with an injury late in the second half (Hofstra TV said he was being checked for a concussion), but he returned shortly after. By the way, Billy Baron only scored 27 points in his first game as a Griff. Just sayin’ :). 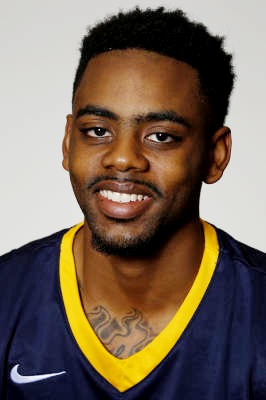 Crumpton suspended, Ryan out: Canisius announced before the game that sophomore forward Jermaine Crumpton (Niagara Falls) was suspended three games for a violation of team rules. He’ll return against St. Bonaventure on Nov. 24. Crumpton was suspended for the preseason in 2014-15. Sophomore forward Cassidy Ryan didn’t travel with the team due to a death in his immediate family. The loss of two forwards certainly hurt the Griffs in this one, as the Pride controlled the glass, 41-34. Hot start: Canisius’ 47 first-half points would’ve been a season-high last year. Most of those came from McMillan, who had 22 at intermission. Both teams shot above 50 percent in the first half. The most points Canisius allowed in the first half a game last year was 46 against UMass. Remember me? : Former Niagara stud Juan’ya Green struggled early but finished with 16 points and an impressive 11 assists. Ameen Tanksley had 12 points and coach Joe Mihalich improved to 25-9 all-time vs Canisius. Brian Bernardi led Hofstra with 26 points while Malik Nichols and Rokas Gustys had 10 rebounds each. T’d up: Valenti was given a technical for a hard foul on Green in the final minute. Starters: Malcolm McMillan, Kassius Robertson, Jamal Reynolds, Phil Valenti, Kevin Bleeker. Next game: Canisius hosts Lehigh on Monday, 7 p.m.
Canisius scored a season-high 87 points in its CIT victory against Darmouth last week and dropped 82 on a 21-win Bowling Green team in the second round. What’s gotten into the Griffs offense? You could attribute the surge to the 30-second shot clock the NCAA is testing in this tournament, the recent return of forward Phil Valenti or the team’s enthusiasm for playing in this tournament. Whatever the reason, the Griffs will need more of it Saturday evening in their CIT quarterfinal matchup against NJIT. The Highlanders are averaging 82 points per game in the postseason and have only been beaten twice this year at home in Newark, N.J.
A win would send Canisius to its first CIT semifinal birth on Tuesday, with the championship to be played Thursday. And if NJIT wins, that would send thier fans back onto the court. They stormed the court on Monday … after beating Cleveland State … in the second round of the CIT. NJIT Highlanders: 20-11 overall, 14-2 home (including four non-Division I teams). RPI: 158. BPI: 187. KenPom: 165. Streak: W5. Canisius Golden Griffins: 18-14 overall, 8-7 road. RPI: 177. BPI: 154. KenPom: 145. Streak: W2. Vegas line: At the time of this writing, NJIT was a 2.5-point favorite. Over/under was 141.5. About NJIT: The country’s last remaining independent team received national attention this year for beating Michigan in Ann Arbor back when the Wolverines were still ranked. Sophomore guard Damon Lynn stands at only 5-foot-11, 165 pounds, but slices defenses for 17.4 points a night while handing out 3.8 assists per game. Canisius’ perimeter defense will have its hands full Saturday. The Highlanders, led by coach Jim Engles, convert 38.6 percent of their three-point attempts, putting them just outside the top 30 nationally. Lynn, a 37.1-percent three-point shooter, leads the team with 121 threes made, but both Winfield Willis and Tim Coleman are more even more accurate, shooting above 43 percent from behind the arc while netting 56 and 33 three-pointers, respectively. Crumpton returns to practice: About the only bit of news from Jim Baron’s media session Thursday was that forward Jermaine Crumpton had returned to practice after missing the last nine games. Crumpton broke his foot in a loss to Monmouth on Feb. 8 and needed a surgery to put a screw in the bone, a team source said. He was cleared for practice earlier this week and is expected to play Saturday. CIT semifinal matchups: Evansville will host UT-Martin in a semifinal game Tuesday, with the Canisius-NJIT winner facing Northern Arizona. If Canisius wins Saturday it would like to host the semifinal game if possible, though NAU may want to host as well. That game will feature a brutal trip no matter where it is played. The CIT championship will be played Thursday. Heath injury update: Josiah Heath is still recovering from a broken nose suffered in the MAAC Tournament loss to Monmouth but is getting more comfortable playing without his face mask. He took it off midway through the first half against Dartmouth and went the whole game without it at Bowling Green. Maher to study transfer rules: Canisius athletic director Bill Maher this week was named to the NCAA’s new Ad Hoc Transfer Issues Working Group, which will study and recommend transfer rule changes that will be considered in the 2015-16 legislative cycle. How to follow the game: The CIT live streams every game on its website, so tune in for a 7:30 p.m. tip. I’ll have updates on Twitter.